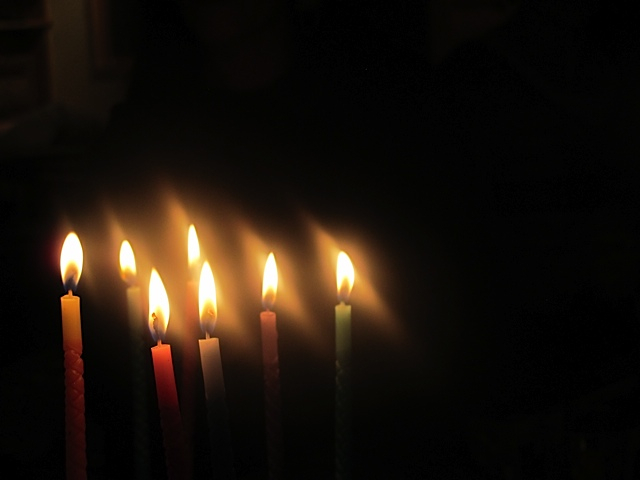 Thanksgiving 2013 – aka Thanksgivukah or Chanugiving, since Chanukah and Thanksgiving fell on the same day last year. Our count in 2013? 24 people! 20 full grown adults, 4 children under the age of five and over the age of two. Heavily skewed to the male side, we embraced our group of enormous eaters. Over half of us began our family holiday on Wednesday at Uncle Kal’s cabin in the woods. As for me, I gave a carload of food to my daughter Rachel to take up ahead of time and we made the hour and a half drive Thursday morning. I spent my day Wednesday finishing pies, picking up fish for Friday dinner, prepping salads and gathering myself after the previous week of children and grandchildren crammed into our condo. 2013 was the first year my sister Susan and her husband Stephen joined us for this holiday. This celebration was over the top. We consumed boatloads of food. Kal doesn’t have a dishwasher at his place so the human dishwashers were at it nonstop. The hot water heater broke at the beginning of the weekend which meant no warm showers or warm water at all. Some of the guests went to our motel room to shower and hose off. So what do 24 people do together for three solid days, aside from eat and nap? 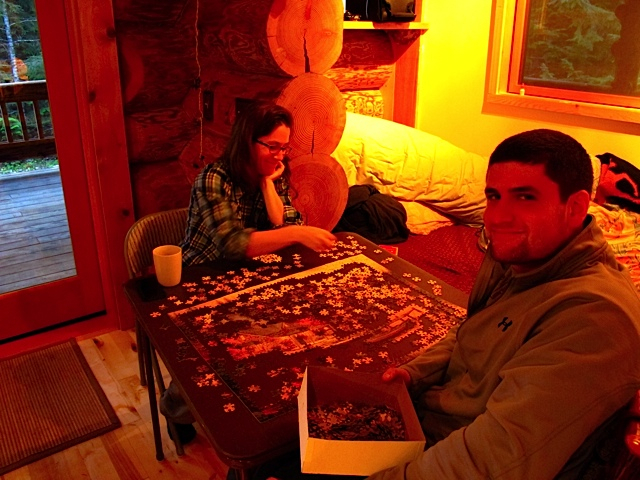 There was a huge puzzle, finally completed late late on Friday. Knitting was ongoing. Books were started and read. Lots of catching up. My nephew Elliot, ever the movie guru, compiled some DVDs of old family movies – and my kids got to see their mother, aunts and uncles, cousins and friends celebrate one year birthdays and Passover seders, and take camping trips to Yellowstone Park…what memories. We sang. We drew pictures. Some went on walks, on runs, did yoga. A few napped during daylight hours. Scrabble games and Settlers of Catan board games were played. According to our family tradition, we made more food than you can begin to imagine — especially noteworthy because 99% of our family is normal weight to thinnish. We are small people but we eat like starving truck drivers. Because it was Chanukah, we not only had traditional Thanksgiving food but included some potato latkes and Cranberry Applesauce, a cute twist to combine both holidays. Here is my version/recipe for Cranberry Applesauce that combined the foods of Thanksgiving (cranberry) and Chanukah (applesauce). 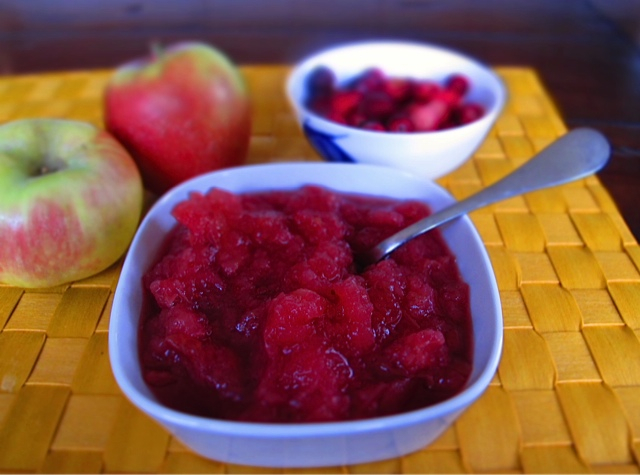 This has sinced graced my table throughout the year – not only is it good and tart, but the color is beautiful if you use this applesauce as a topping for potato pancakes, for yogurt, or anything else. Nothing is easier than putting everything into one pot at the same time, waiting a few minutes and being DONE. You’ll look like a master chef. I am including a pressure cooker version as well as a stovetop recipe. 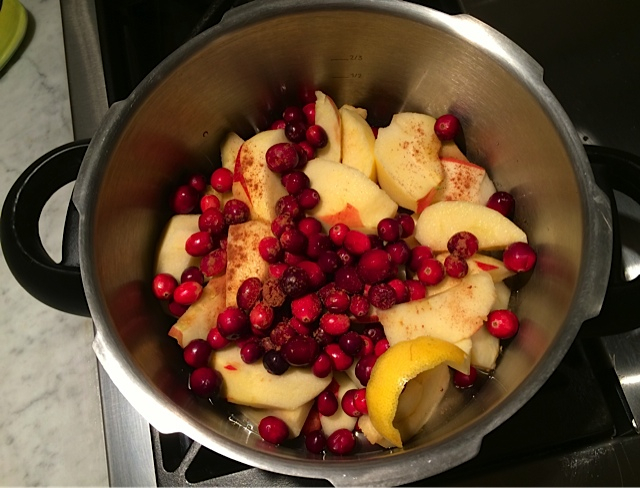 Apples, cranberries, pressure cooker – voila! It’s not just for Thanksgivukah/Chanugiving anymore!! Put all the ingredients in a 4-6 quart pressure cooker and lock the lid. Bring to high pressure. Cook for three minutes at high pressure then take the pressure cooker off the heat and let the pressure come down on it’s own. Remove the lid, and stir together to combine the berries and apples. The applesauce will be a little chunky. If you prefer smooth applesauce, pulse it with an immersion blender or cook it a minute longer – four or five minutes instead of three. Put everything into a 4-6 quart pot and bring to a boil, cover and let simmer for 25 minutes or until everything is tender. Mash with a potato masher or immersion blender. This cranberry applesauce keeps, covered and refrigerated, for around 10 days and freezes well too. It is a good make -ahead holiday dish. This entry was posted in Condiment, Odds & Ends and tagged Apple Sauce, Cranberry Apple Sauce, Cranberry Sauce. Bookmark the permalink.